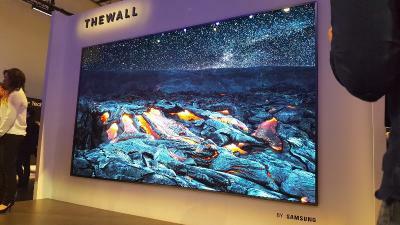 » Here is Samsung's 146" Micro-LED TV, "The Wall"
As reported a couple of months ago, Samsung unveiled its first Micro-LED TV, aptly named "The Wall". This is a 146-inch tiled 4K display that is almost 8 times larger than a 55" TV in area. Samsung says that this display will ship in 2018 - but it did not reveal the price or expected release date. It's also not clear whether you will be able to actually customize this display with smaller and/or larger sizes. Samsung is looking for a new premium TV technology as its QLED TVs failed to keep up with LGD's OLED TVs, and has seen its premium TV market share fall from 57% in 2015 to 20% in 2016 (LG, meanwhile, managed to increase its market share from 17.5% in 2015 to 43% in 2016). Samsung is said to be looking at several alternatives for its micro-LED TV project, one of which is to acquire Taiwan-based PlayNitride - a deal that was already reported in April 2017 but is reportedly progressing. It will be very interesting to see how Samsung's Micro-LED TVs fares against competing technologies, and will hopefully kickstart the Micro-LED industry. 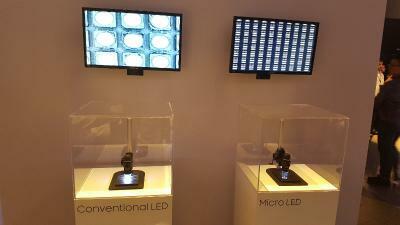 Back in 2012, Sony demonstrated the world's first Micro-LED TV, the 55" FHD Crystal-LED panel. Sony never released this product commercially (although it does offer Micro-LED large outdoor signage displays).